Summer time in the city is good living. I took in the Corydon Business Improvement Zone (Biz) concert series on Corydon Avenue Saturday July 28, 2018. Wonderful music, great atmosphere and the weather was perfect. I enjoyed listening to members of the community while I campaigned and we shared ideas. The venue was family friendly and the support for this concert was quite evident judging by the strong attendance. Several announcements were made about family members celebrating birthdays and anniversaries. The whole evening had a wonderful community feeling. If you haven’t had a chance to attend yet, I encourage you and your family to do so. The concert series is not only an enjoyable event but also brings foot and bike traffic to the street therefore helping to promote businesses within the area. My hat goes off to the Corydon Business Improvement Zone team that made this evening and each concert in the concert series happen this summer. You are a credit to your community. You make a positive difference. Our family was at the field today to support and cheer on our family member Sara-Jane Milne on the Canadian Women’s team “Mint”. It was a super entertaining game and we lost by 1 point to the New Zealand Women’s team “Foxes”. Watching the post game activities of friendship and spirit was inspiring. The event is taking place at Little Mountain Sportsplex till August 4, 2018, I encourage folks to go if they can. Good luck to all the teams! Thank you to all the organizers and volunteers for the amazing setup and your great work. Great team #spirit by everyone. It is great to see the exchange district alive and bustling. For those that are not aware, I used to pull a rickshaw in downtown Winnipeg. It was a summer job from 1992 until 1999 with the Pan Am Games being my last time pulling. I thoroughly enjoyed showing visitors and locals around our downtown and exchange areas. The Winnipeg Fringe has done a lot of amazing things over the years and the area has really grown up since my rickshaw days. The changes to the Old Market square stage are wonderful and modern. The Winnipeg Fringe makes great use of our downtown spaces and helps to bring thousands of folks downtown. Summer festivals have a largely understated impact on our city. Festivals create jobs, boost our image on the world stage, and support the economy by bringing clientele to downtown businesses and by indirectly supporting companies that provide support services, air travel, media and advertising. Festivals also build a loyal following therefore bringing visitors back year after year. The city has an important part to play in supporting these festivals by helping to provide services, communication plans, street closures, as well as future planing for capacity and active transportation to name a few. 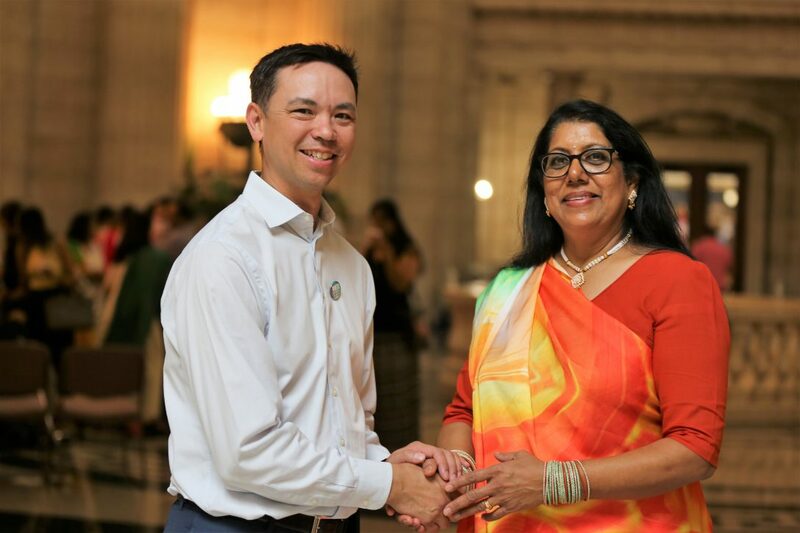 With your support in being elected, I will continue to support the Winnipeg Fringe and other important festivals that make a positive difference in our community. Another busy week of campaign work. I had the opportunity to visit Fort Whyte Alive @FortWhyteAlive where my son was enrolled at a day camp to learn about nature and the environment within our city and province. It is wonderful to have this resource and amazing facility in our city. It provides children with the opportunity to learn more about the environment and the on-site farm provides education regarding food resources. Fort Whyte Alive also encourages children to give back to their community by volunteering as camp counsellors when they get older. The facility also recently installed solar panels with help from provincial rebates and the company Sycanmore Energy Inc. I wanted to learn more about this so I spoke directly with Andrew Meyer, Director of Sales and he filled me in on the innovations taking place within the solar industry. I support these types of alternative energy initiatives as they help businesses grow, create more jobs and work towards a cleaner environment. With your vote in October’s election, I will make sure that Winnipeg continues this important work. Tonight was a great night of meeting people from within and outside Winnipeg as I canvassed the downtown area of Fort Rouge/East Fort Garry. I was able to chat with a fellow who works for Great West Life and who has travelled all around the world. He was walking from Osborne Village and planned to use the concourse to get back to the Fairmont Hotel @fairmontwinnipeg. I shared the plans for the Osborne walking bridge and its location. When asked about Portage and Main he vocalized that he especially appreciated using the underground concourse in the winter time as he only has to be outside for one block in the cold for his walk to work. He also had a few suggestions regarding how to improve the signage and he offered his opinion that the unique shape of the intersection means that it is not set up to be a classic 4 corner pedestrian walking intersection. It was a great conversation and I ended by suggesting that he try Mitzi’s Chicken Finger Restaurant, one of the best family owned downtown restaurants. Shirley and her staff do an amazing job every time. My next stop was the IdeaMill on the 3rd floor of the Millennium Library on Donald Street. This is an absolutely wonderful public facility. In the past I used to go to the Centennial Library to study for school and to play chess on the 2nd floor. More recently the Library has been a good place for office workers to have their lunches in the wonderful outdoor green space area. The purpose of today’s visit was to recieve a tour of the IdeaMill and to lend my support to these initiatives. I was able to meet with Arron, a helpful member of the planning team, for an extensive tour of the IdeaMill which is very impressive. Winnipeg needs places and ideas like this to help us grown and develop. Tourism is an important part of downtown Winnipeg. I speak from experience as a past rickshaw operator where I served as an unofficial ambassador and tour guide of our wonderful city. It is important to make people feel welcome, safe and entertained in our downtown. Tonight I was able to speak with a wonderful couple from Moncton, NB. It was lovely to hear their thoughts on downtown. They offered that they thought it might be a good place to move to and of course I agreed and did my best to highlight the reasons why. I also had the opportunity to listen to a group of Winnipeg Transit drivers. Winnipeg Transit serves an important function for citizens to commute to and from work and to travel with their families within the city. It is made up of an amazing group of people who not only drive the buses but who also act as informal city ambassadors and tour guides. I strongly support this amazing group of people who are helping to transport thousands of people. Having been a past 12 hour and then 10 hour shift worker, I can appreciate the hard work that they do. Summer time is really for the kids. A big part of being a parent is finding fun and positive activities for your child to do. This weekend, my son met up with friends at the Fort Rouge Leisure Center on Osborne Street for Car Town. For those that are not familiar with Car Town, it’s a program run by the city to give kids a brief overview of the rules of the road and then offers an opportunity to drive battery operated mini cars. It’s a fun experience for an hour and the kids each receive a Car Town driver’s license. I appreciate the the instructors’ approach with the kids, both positive and helpful. If you would like to take your kids or nephews/nieces you can find further information in the leisure guide. You can register online or by calling 311. I whole heartedly support activities like this in our community. We also recommend having an ice cream at Bridge Drive In (BDI) @BridgeDrivein afterwards….just remember cash only. Cheers! I would like to extend a huge thank you for the first campaign contributions! Cheers to Stan M. and Judy Thompson. Judy is my mother and a long time city employee having retired from the Winnipeg Public Library after 24 years. She has always been there for us and I am very grateful for her support. That brings our campaign to $800.00. Let’s keep those donations coming in. Your donations will make a huge difference for us to be successful. Thank you. I recently visited a great gem in our ward this July; the Wildewood Golf Course. Carved out of the Fort Garry Forest, this nine-hole course is an important asset in our area. Unfortunately my day was cut short due to lightning and rain but I look forward to going back in the future! Community recreation spots and green spaces within our neighborhoods are important to the health and wellness of everyone. I am a strong supporter of city park recreation initiatives in Winnipeg. Municipal golf tournaments on our public courses are not only a great way to bring newcomers into our neighborhoods; but a way to participate together in an activity that leads us towards an active future.